Last week on Monday, Jordan had a bad fall at home. He was just walking to the bathroom to wash his hands and he tripped over his feet and landed on his own foot. We thought it would be ok, but even after ice and rest, he couldn’t really walk. 2 days of resting, and he was back in school, because he said he could handle it and because it was exams, wearing sandals cos he couldn’t bear to have his feet in socks and shoes. 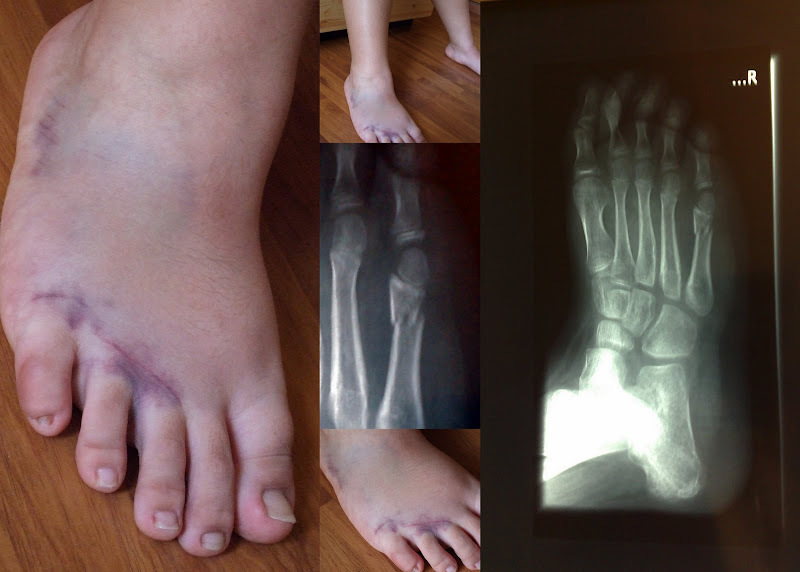 His physiotherapist was concerned, and told us about fractures in the foot. She also said to look out for swelling that happens again, after the bruise had subsided. It had swelled and turned an angry purple, but subsided after about a week. By the weekend he was walking ok. Yesterday his foot was uncomfortable when he tried to wear his night splints to sleep, and so he went without. He woke up and went to school as per normal. When I picked him up after, he commented, dunno why but my leg very pain today. Since yesterday. I took a look at it, and since I was told to look for swelling, I saw it, and toggled between taking him to our family GP or KK. Decided on KK cos saw the need for possible x-ray. He’s been walking on a fractured metatarsal (see his pinky) for a week and a half. Oh the mommy guilt!! so what’s the treatment? cast? splint? I injured my little toe b4 in the office (dropped the heavy trolley on it!!!! ahhh.). No treatment, just told to keep foot off walking too much. My little toe is somwhat disfigured/misshapen but other than that its ok now.